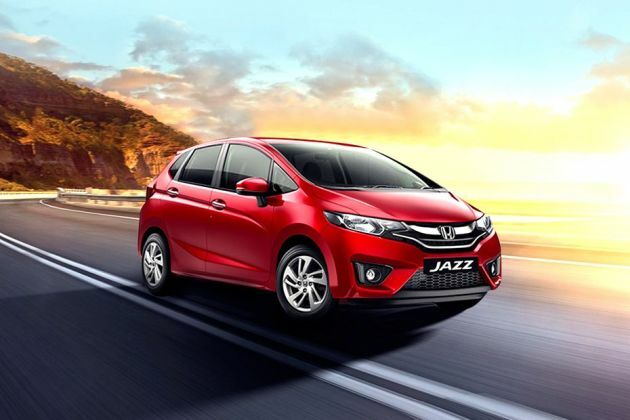 Finally, HCIL has launched the much awaited hatchback Jazz in the Indian car market in quite a few trim levels. Among them Honda Jazz 1.2 E iVTEC is the entry level petrol variant. This vehicle is designed with an aerodynamic body structure along with an attractive front, side and rear profile. Its front fascia has a black slatted radiator grille including a chrome plated logo in the center. Apart from this, it comes with a bright headlight cluster, body colored external wing mirrors, door handles and so on. It comes with an advanced braking mechanism along with a proficient suspension system, which keeps the vehicle agile in every condition. It will compete against the likes of Hyundai Elite i20, Maruti Swift, Fiat Punto Evo, Volkswagen Polo, Ford Figo and others in this segment. It has a roomy internal cabin with a wider distance between the two rows of seating. This is decorated in a two tone color scheme, while the center console and dashboard gets chrome inserts for added class. The cabin is incorporated with some innovative aspects that ensure great comfort while traveling. Some of these include well cushioned seats with integrated headrests, air conditioning unit, sun visors with driver side vanity mirror, foldable rear seat to increase boot space and many other such aspects as well. It is being sold with a standard warranty of two years or 40000 Kilometers, whichever comes first. The car manufacturer has given this variant an aerodynamic and compact body structure with a lot of styling aspects. Starting with the front fascia, it is designed with a bold radiator grille, which has a thick black slat along with a company insignia in the center. This grille is surrounded by a well-lit headlight cluster, which is integrated with bright headlamps that gives great visibility ahead and side turn indicator as well. Just below this, it has a body colored bumper, which houses a large air intake section for cooling the engine. Also, this bumper has protective cladding fitted beneath it, which prevents the vehicle from minor damages. Then, there is a sleek bonnet, which has a couple of expressive lines and gives the frontage a distinct look. The windscreen is pretty wide and is accompanied by a pair of intermittent wipers. Not only this, the designers have done a fabulous job for giving the side profile a lustrous look. It comes with some strong character lines and black finished B-pillars. While the outside rear view mirrors as well as door handles are painted in black color. Its flared up wheels arches are fitted with a set of steel wheels, which are covered with full wheel covers. Coming to its rear end, this hatchback features a radiant tail light cluster that is powered by halogen based reverse and brake lights along with indicator. The large boot lid is embossed with variant badging. The bumper is painted in body color and comes with a black under guard. It has a wide windscreen, which is accompanied by a high mounted stop lamp. Under the bonnet, this hatchback is fitted with a 1.2-litre petrol engine, which comes with a displacement capacity of 1198cc. It carries four cylinders and sixteen valves using a single overhead camshaft based valve configuration. The company has mated the engine with a five speed manual transmission gear box, which sends the engine power to its front wheels. It powers the engine to zoom towards a top speed in the range of 140 to 145 Kmph. At the same time, it can break the speed mark of 100 Kmph in close to 15-16 seconds from a standstill. This engine is incorporated with an advanced programmed fuel injection supply system, which allows the vehicle to deliver about 18.7 Kmpl of decent fuel economy. This petrol mill can churn out a maximum power of 88.8bhp at 6000rpm in combination with a peak torque output of 110Nm at 4800rpm. Like any other car model in this portfolio, it is also blessed with a reliable braking system along with a proficient suspension mechanism. Its front wheels have been fitted with a set of disc brakes, while the rear ones get conventional drum brakes. In terms of suspension, its front axle is assembled with a McPherson strut, while the rear axle is equipped with a torsion beam type of mechanism. Moreover, both axles are further accompanied by coil springs. On the other hand, its internal cabin is incorporated with a collapsible electric power assisted steering system, which not only supports its turning radius, but also makes the maneuverability quite easier to the driver even in heavy traffic conditions. It is equipped with an efficient air conditioning unit using which, the temperature inside can be regulated as required. The advanced instrument cluster is integrated with a lot of functions that further turns out useful in giving updates about the vehicle's status. The list includes a low fuel warning light, driver seat belt reminder notification, an electronic tripmeter, a tachometer, odometer and many other such warning and notifications. The power steering wheel comes with tilt adjustment function that helps in better handling. Apart from these, it also include few other aspects like cup holders, a center armrest, seat integrated headrests, glove box compartment, inside rear view mirror and some utility based features that adds to their convenience. Being the entry level variant, it is equipped with quite a few standard protective features, which are essential for safe driving. The company has offered this trim with three point ELR (emergency locking retractor) seat belts for all passengers and it also has driver seat belt reminder notification on instrument panel. It has central locking system that allows one to lock and unlock doors just at the push of a button. In addition to these, the list of other features include an engine immobilizer for preventing the vehicle from unauthorized entry, door ajar warning lamp, a high mounted stop lamp, a full size spare wheel and a few other such aspects. 1. Exteriors have many styling aspects. 2. Internal cabin space is quite good. 2. Safety standards and comfort features need to improve. 3. Fuel economy is not up to the mark. Honda Jazz is available in 5 different colours - White Orchid Pearl, Modern Steel Metallic, Golden Brown Metallic, Radiant Red, Lunar Silver.